Saw this on someone's website and thought it was hilarious. At 14 humility forced me to concede that there were might one or two things I didn't know. This made the Internet rounds many years ago. I printed it out and gave copies to my daughters as they grew into teenagehood. Didn't do much good, though. For instance, I wasn't a very good ping-pong player, but those who could play well didn't want to be bothered teaching me to be a better player. I played them anyway, and lost, and lost, and lost... enduring such endearing names as "guppy," "sucker" and worse. Then one day I won! I beat a very good player! And he stopped playing ping-pong with me. He'd beaten me at least a hundred times, but as soon as I beat him just ONCE, he wouldn't play me anymore. It was as if people I knew didn't want me to do well in anything. But I persevered. I've come to realize this is a terrible attitude for anyone to have, let alone so many! 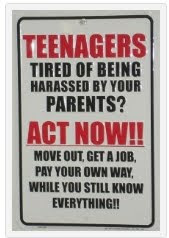 But it is NOT limited just to teenagers. We all need to learn to swallow our pride and love each other the way Jesus told us to. Admit to our faults and apologize when we're wrong. If we did, I think it would be a much nicer world!